Hotels provide private serviced rooms for guests. They range from very basic budget-style to extremely luxurious accommodation. 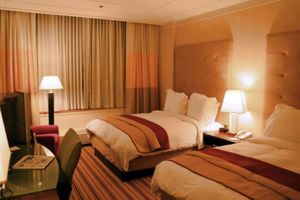 A typical twin hotel room. Single rooms are for single travellers. In many hotels, a single room is actually the same as a double room. Double rooms are for two travellers sleeping in the same bed. Might be used by one guest and is referred as Double Sole/Single use. Twin rooms have two separate single beds. Triple rooms have either three separate beds, or a double bed plus a single bed. Quads rooms are designed for 4 people or more. Suites are complete apartments with multiple rooms, generally intended for longer stays. There is considerable variation and many frills within these basic types, the rule of thumb being that the more you pay, the larger your room becomes. Some business-oriented hotels offer an executive level, where a steep premium gets you access into an airline-style lounge and typically some perks like "free" Internet access or pay-per-view movies. Naming for these rooms varies, with eg. the Kuala Lumpur Hilton dubbing even its cheapest rooms as "Deluxe" and the next category up being "Executive" — but you need to upgrade one more step to an "Executive Suite" if you want to actually get the executive level perks. Some hotels are now taking an active stance on being smoke free. Bed and breakfast (B&B). The morning meal is included. This may range considerably from a simple roll and coffee to an elaborate spread. Half board (aka half pension, demi-pension, modified American plan). A hotel rate that includes breakfast and one additional meal, typically dinner. Also called Modified American Plan and demi-pension. Full board (aka full pension, full American plan). A hotel rate in which three meals a day are included in the price. All inclusive. All meals and drinks are included. The list of "free" drinks is usually limited though: house wine is probably OK, champagne probably isn't. Hotels may also charge a mandatory fee in addition to the standard room and board charge to provide access to additional facilities. This is typically called a Resort Fee and can include access to things such as exercise facilities, pools, and high-speed internet access. The supposed "Seven Star" Burj al-Arab hotel in Dubai. The guide below is by necessity a generalization, as star ratings are awarded by each country according to their own rules, and the difference between a 3-star and a 4-star may be something as obscure as having a minibar in each room. It's also worth noting that star ratings are often 'sticky', in the sense that once awarded they're rarely taken away: a four-star built last year is probably still pretty good, but a four-star opened in 1962 and never renovated since may well have turned into a dump. Note also that the ratings are weakening as marketers misuse them. The notion that a hotel can be six or seven stars is a joke among travel professionals since most respectable hotel rating systems do not give out a rating higher than five stars. The consensus is since so few hotels really can achieve the five star rating then there shouldn't be a rating higher than five stars. An example of a claimed "seven star" hotel is Dubai's Burj al-Arab. It's certainly one of the most luxurious hotels in the world (as awarded earlier by Conde Nast Traveller Magazine). In reality, it is a 5 star deluxe property (the alleged seven star status is not often corrected in the media, though). The five-star hotels is the quintessential luxury hotel, offering thrills above and beyond the actual needs of the travel. They have restaurants and night spots that are world class, with food and entertainment that draw non-guests to sample it too. Five-star hotels also tend to have opulent and expensive decorations; fancy gyms, swimming pools and spas. Major five-star chains compete to offer the most ludicrous thrills imaginable: Loews offers dog-walking services, while Conrad will let you order from a menu of pillows. Needless to say, all this comes at a steep price, and you're unlikely to be able to justify the expense of a five-star for ordinary business travel. The other downside to five-stardom is that hotels that can jump through all the hoops to achieve the rating are likely to be large and impersonal. The four-star hotel is a good business hotel. Everything works smoothly, there's Internet in every room, a well-equipped business center, they'll arrange your airport transfer and room service is palatable and only somewhat expensive. And your boss will probably not faint when they see the bill. Major chains: Hilton, Marriott, Novotel (Accor), Crowne Plaza (IHG), Kimpton Hotels and Radisson BLU Hotels (Carlson Rezidor). Three-star hotels are solid but dull. Your room will have an attached bathroom and there's probably a restaurant downstairs and 24-hour reception service. In this class, hotels will typically be small to medium size and offer more extensive facilities that one star hotels. Two star means no-frills hotel. In many countries, two stars means that your room may have its own bathroom and there's almost certainly a TV and perhaps a telephone in your room, but rooms are bare-bones and you're unlikely to want to spend any more time than strictly necessary inside. You don't see many of these, and with reason. One-stars are not just no-frills, but often downright dodgy: rooms are barely functional, shared bathrooms are somewhere down a corridor and the painted ladies from the all-hours karaoke bar next door dance the horizontal tango all night long in the room next to yours. Unrated hotels are a mixed bag. Most, it is safe to say, are hotels that are either too dodgy to achieve even the meager requirements of a one-star — or, alternatively, too small and personal to be able to offer (say) 24-hour room service, although the service and amenities offered are otherwise of five-star caliber. There are also selective hotel groups for smaller properties that generally select for high quality, boutique hotels. In many cities, there is one famous old hotel, usually going back to the Victorian era, that was historically the place to stay. Of course, the newer luxury hotels may have better facilities, but the old place has cachet. See Grand old hotels. International brands are a popular choice with business travellers, as they generally offer standardized predictability. The downside for leisure travel is that they are rarely very exciting or exotic, and there can still be considerable variation within the brand. The following lists major international hotel brands only, with over 500 hotels in multiple countries. Local chains can be found in individual country and city articles. Accor  From the luxury Sofitel brand to the basic Etap, Accor has hotels in a range of economic travel segments, from luxury to budget class hotels. Accor Hotels is probably the most established company in Europe and offers great choices for the backpacker and the discerning guests. Accor's subsidiary Compagnie des Wagons-Lits  provides hotel services for trains. Best Western International  is the world's largest hotel brand with more than 4,200 hotels in 80 countries. In 2006, the company celebrated 60 years of providing quality customer care and dedicated service to Best Western guests across the globe. The chain also operates in growing economies (like Armenia or Eastern Europe): seriously refurbishes interior of hotels built dozens year ago, introduces western management -- and then sells it to US/Canadian/Australian travellers. This results in low rates and a good service. Carlson Hotels  is a leading global hotel company with more than 1,080 locations in 78 countries. Its brands include: Radisson®, Country Inns & Suites By CarlsonSM, Park Inn®, and Park Plaza®. Carlson Hotels is part of Carlson, a global hospitality and travel company. Hilton Hotels  Hotel brands include Conrad, Hilton, Doubletree, Embassy Suites, Waldorf-Astoria, Hampton Inn, and Homewood Suites. Hyatt Hotels Hyatt has over 460 hotels and resorts in more than 44 countries. The company brands include Park Hyatt, Grand Hyatt, Hyatt Regency, Hyatt Resorts, Hyatt Place, Hyatt Summerfield Suites and Andaz. Fairmont Raffles Hotels International The company brands include Raffles, Fairmont and Swissôtel with 98 hotels and resorts in 27 countries worldwide. InterContinental Hotels Group  (IHG) hotel brands include InterContinental, Crowne Plaza, Holiday Inn, Holiday Inn Express, Hotel Indigo, Candlewood Suites, and Staybridge Suites. With more than 4,400 hotels in over 100 countries, IHG is the largest hotel group in the world by number of rooms. Marriott  hotels include Renaissance, J.W. Marriott, Marriott, Courtyard, Fairfield Inn, Gaylord Resorts, Residence Inn, TownePlace Suites, SpringHill Suites, and Marriott Vacation Club International. Marriott also owns Ritz Carlton. .
Louvre Hotels  brands are primarily located in Europe. The upper brand (Concorde Hotels ) includes Hotel de Crillon or Hotel Martinez. The economic brands include Premiere Classe  (1 star hotels) or Campanile  hotels, two very well known brands in France and Eastern Europe (more than 800 properties). Pan Pacific Hotels and Resorts is a hotel-management company with a portfolio of 15 hotels in 9 countries. The company is a founding member of the Global Hotel Alliance, the world's largest alliance of independent hotel groups. Radisson  and its affiliates Country Inn, Park Plaza and Park Inn have over 1700 hotels around the world. Shangri-La  is a Hong Kong based hotel chain that consists of the Shangri-La, Trader, Kerry and Hotel Jen brands. The 5 star brands can be found throughout China but they also have numerous hotels throughout East Asia, Middle East (UAE, Qatar and Oman), Africa (Maldives and Mauritius), Australia, United Kingdom, Philippines, Fiji, France and Canada. Starwood Hotels  brands include Le Meridien, Sheraton, St. Regis, Luxury Collection, Westin, W Hotels, Four Points, Element, and Aloft. Trump Hotels  is a hotel management company that manages luxury, 5 star hotel properties in New York City, Chicago, Las Vegas, Hawaii and Panama. These 5 star hotel properties offer event venues, restaurants and luxury accommodations. Viceroy Hotels & Resorts  locations include Viceroy New York, Cassa Hotel 45th Street New York, Viceroy Miami, Viceroy Snowmass, Viceroy Palm Springs, Viceroy Santa Monica, L'Ermitage Beverly Hills, Avalon Hotel Beverly Hills, Hotel Zetta San Francisco, Le Meridien Delfina Santa Monica, Sugar Beach, A Viceroy Resort, Viceroy Anguilla, Viceroy Maldives, Yas Viceroy Abu Dhabi, and soon Viceroy Dubai. Wyndham  has 6,500 hotels, concentrated mostly in North America and the Caribbean. Its vast constellation of brands includes Days Inn, Howard Johnson, Ramada, Super 8 and Travelodge. Wyndham Hotels are the upscale brand of this corporate hotel chain. Plateno Group  total hotels with over 6000 hotels in over 300 destinations with 10 brands include Maison Albar, Portofino, H12 Hotels, ZMAX, James Joyce Coffetel, Lavande Hotels, 7 Days Premium, 7 Days Inns and Hampton by Hilton. Hotel Loyalty Programs are corporate sponsored membership clubs for hotel frequent guests and are similar to airline frequent flyer loyalty programs. Membership is free in most hotel chains. The purpose of Hotel loyalty programs are to ensure that a hotel company retains its clients as frequent guests by offering added value benefits for staying as a guest or booking conference rooms and facilities at their hotels. The basic idea is every eligible hotel night or every dollar you spend at hotel brands participating in the corporate hotel loyalty program earns points, which can be exchanged for rewards like hotel rooms, room upgrades and airline miles. Some hotel chains, particularly in the luxury segment, operate programs that do not award points, but offer frequent guest recognition with added value benefits such as complimentary room upgrades, restaurant and spa discounts, and additional amenities in recognition of the loyal guest. Hotel co-branded credit cards are a common strategy for earning hotel loyalty points and benefits when not staying at hotels. An additional incentive for a hotel frequent guest is premium membership. Each corporate hotel loyalty program has its own criteria for elite membership. Hotel loyalty program elite membership is generally earned by a frequent guest when certain thresholds are met for the number of hotel stays, hotel nights, or money spent. A hotel stay is defined as consecutive nights at same hotel under same name, regardless of the number of different reservations. Elite membership in a hotel loyalty program is generally based on activity within a calendar year. Sleep at the loyalty program member hotels for sufficient nights or stays, or spend enough money and you'll get a silver/gold/platinum/diamond hotel program membership card entitling you to various perks, such as hotel points bonuses, lounge access, free upgrades, guaranteed rooms, etc. High level elite membership in the major hotel chain loyalty programs, generally with the benefit of complimentary room upgrades, takes between 25 and 75 hotel nights in a 12-month period. Fiesta Rewards, the frequent guest program for Grupo Posadas at their following hotel brands: Live Aqua, Fiesta Americana Grand, Fiesta Americana, Fiesta Inn and One Hotels in Mexico as well as Caesar Park and Caesar Business in Brazil, Chile, and Argentina . Wyndham Rewards, for Wyndham branded hotels. Allows guests to earn hotel points for their stays. This page was last edited on 10 November 2018, at 10:34.